Small Country table with hinged top. 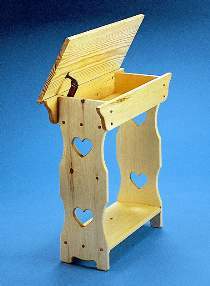 Generous storage compartment holds games, magazines, sewing notions etc. 25"L x 11-1/2"W x 25"H. Side Table Hardware parts includes one safety lid support and one pair of hinges with mounting screws. Project plan, remaining screws, screw hole buttons, wood and wood finish are not included.